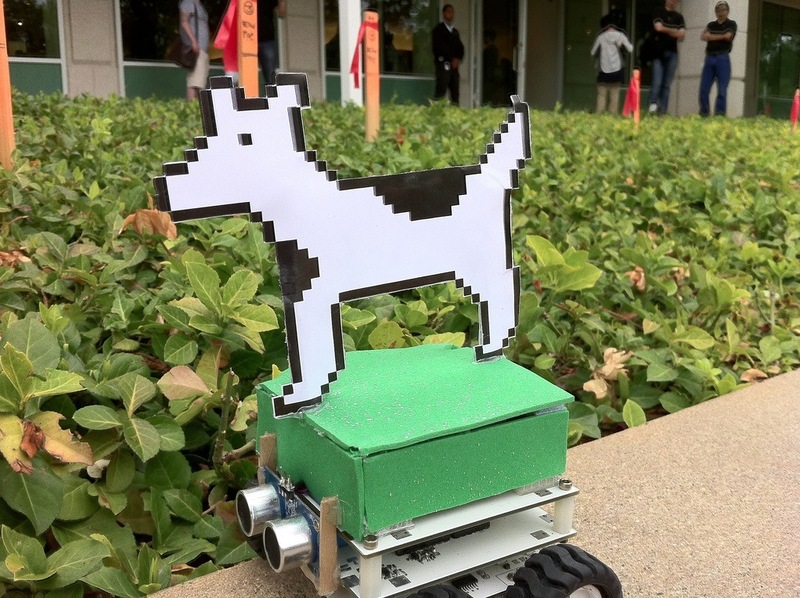 Clarus as the mascott of the Apple DTS team has inspired many. 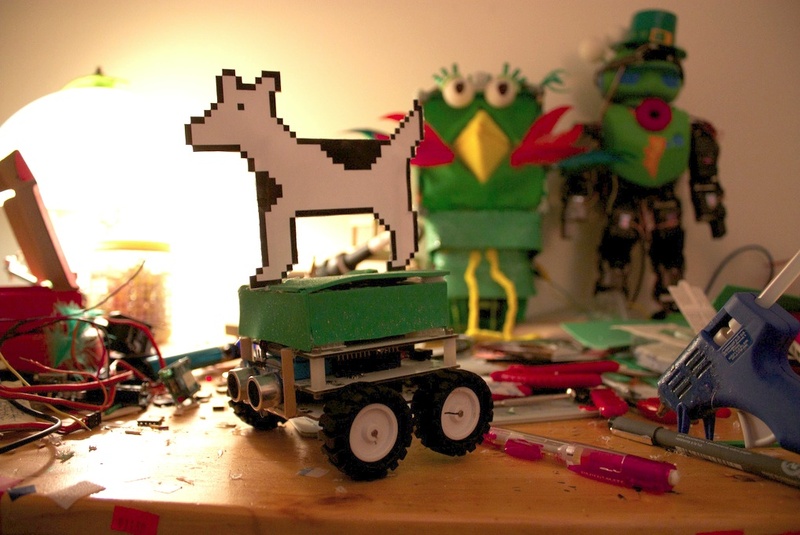 Here discover all "home-made" objects related to Clarus (DIY) and discover the power of imagination. 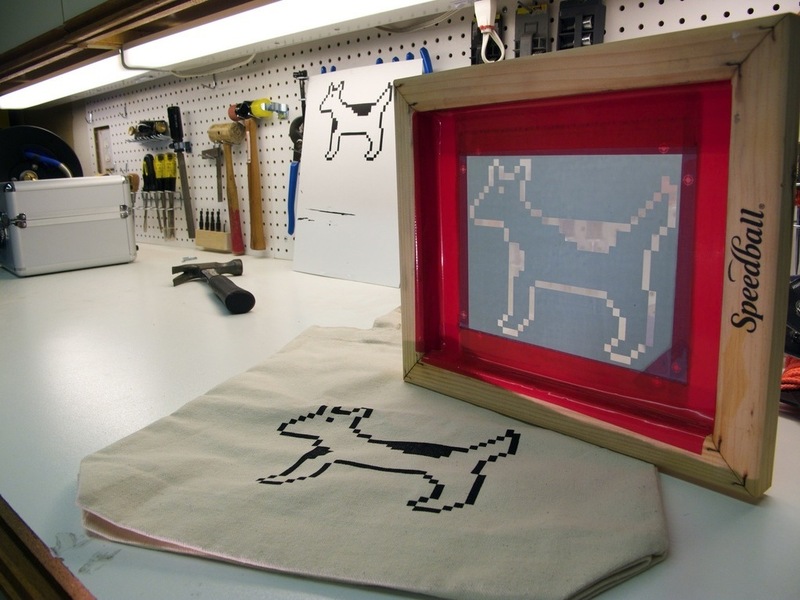 We have a separate collection for arts in real world. 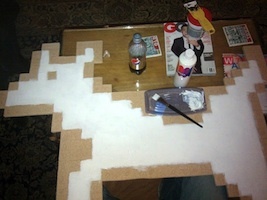 Floating Moof & Vikings !? 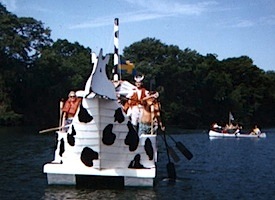 Jim Gould participate to the 95' KHFI Raft Race (Austin), he tooks pictures. 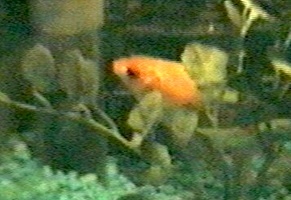 Torgo build up a MacQuarium (Aquarium made from a Macintosh 512k) and has in it, 2 fishs, one called Moof and the other Clarus. 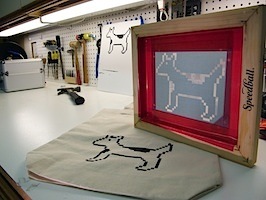 Mike customize its iBook and explain how he does on its web site. 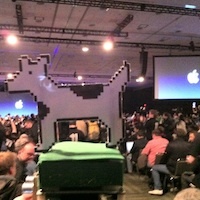 "It was fun at WWDC watching everyone do a double take when they saw my iBook. 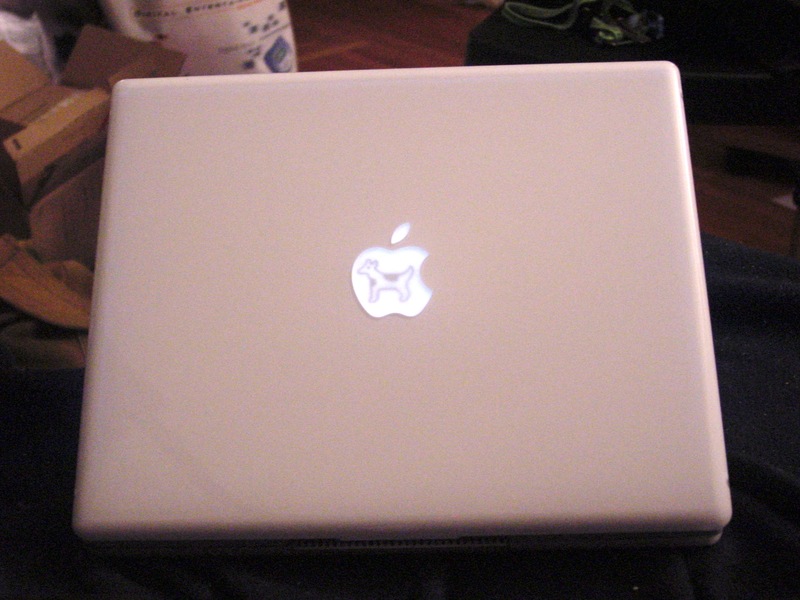 The first few days, nobody had seen an iBook so I was swamped with people wanting to play with it. 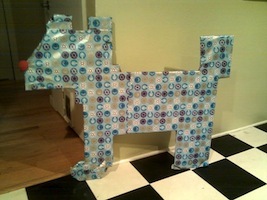 Everyone loved it, and even though nearly everyone there had a Titanium, many of them were jealous! 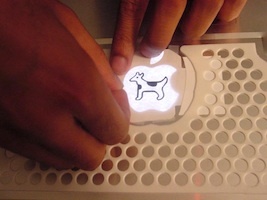 After playing with it they suddenly realized Clarus was in the apple. 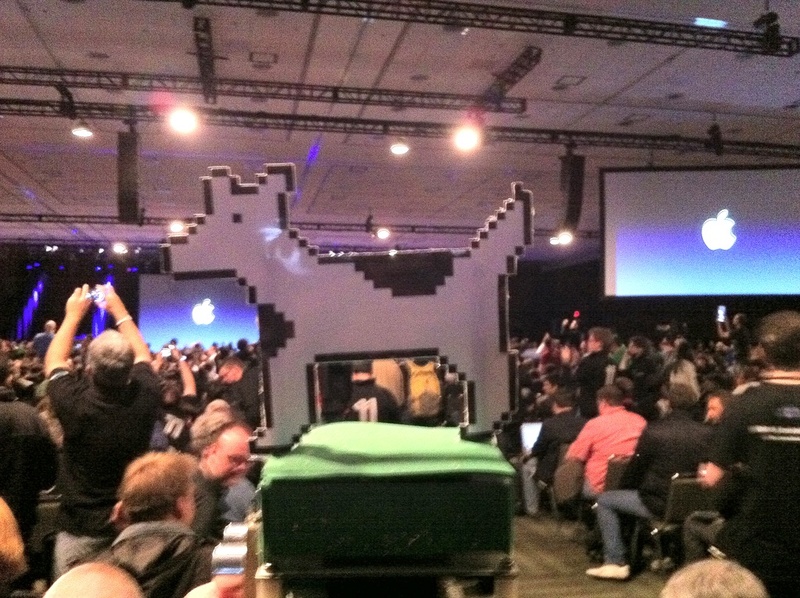 Aaaaanyways, I was sitting in the front row at WWDC and I saw Steve Jobs take a peek at my new iBook when he was taking a swig of water on the sidelines and had a perplexed look on his face and later when he looked back he smiled. 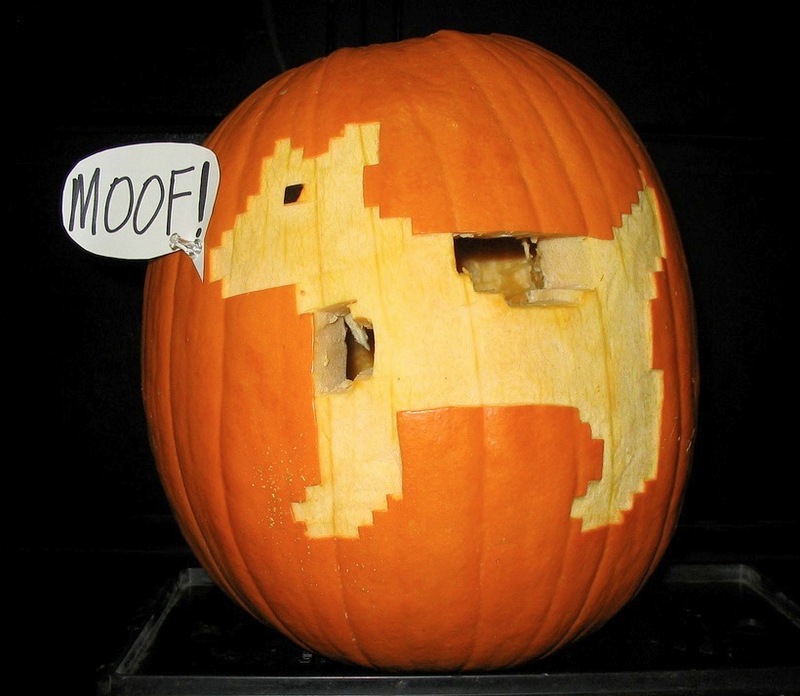 I didn't believe it at first, but 2 other people sitting in the front row near me later confirmed it - yep, Steve Jobs himself smiled at my iBook :-)"
For Halloween 2004, Nick carved a pumpkin with Clarus the Dogcow and she says moof! 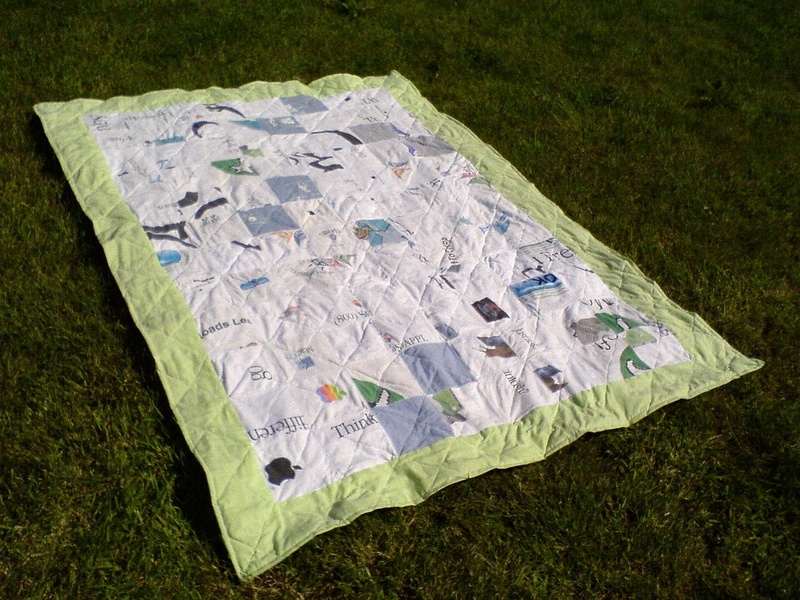 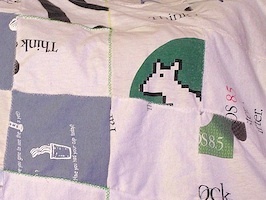 Anna made herself this geek blanket with 8 x 12 pieces of old Apple T-Shirts. 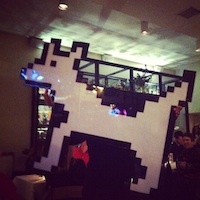 Benjamin capture a stiched Dogcow, nice picture. 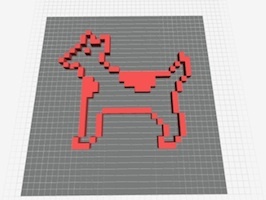 Theo has a lot of imagination. 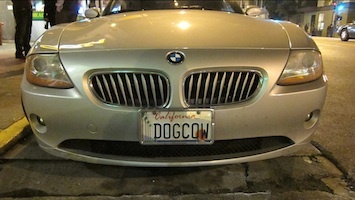 Tantek has a Dogcow plate on his car. 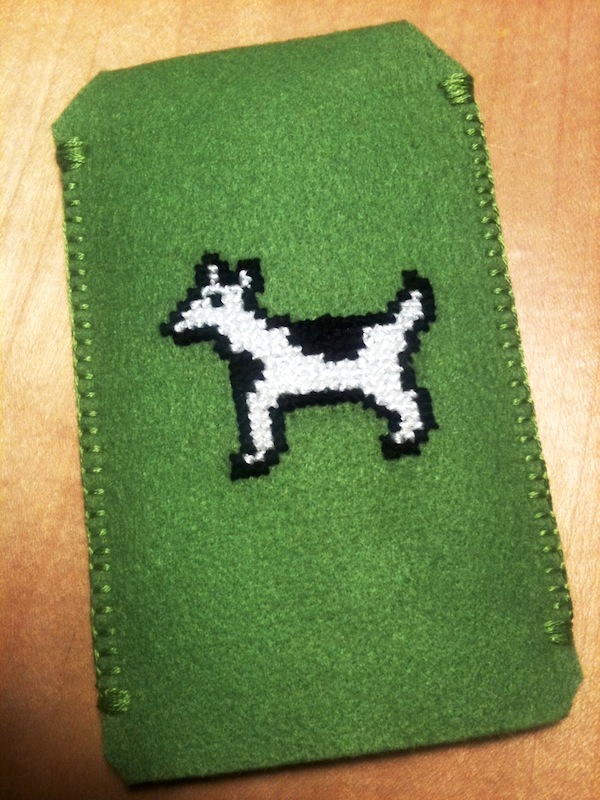 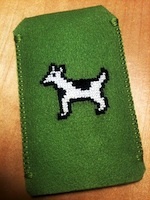 a small bag for your iPhone featuring Cairo's Dogcow stiching by hand. 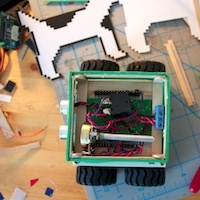 Erin build robots for fun. 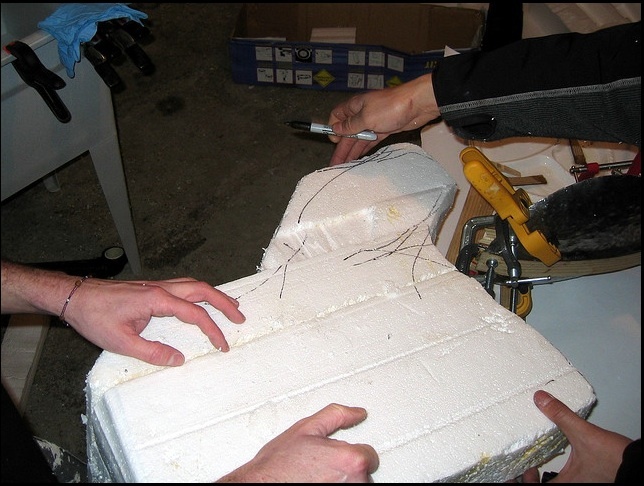 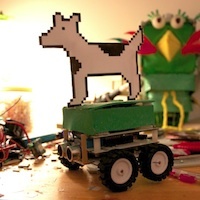 In 2011 Erin build a new RobotGrrl robot featuring Clarus on top : Dogcow bot. 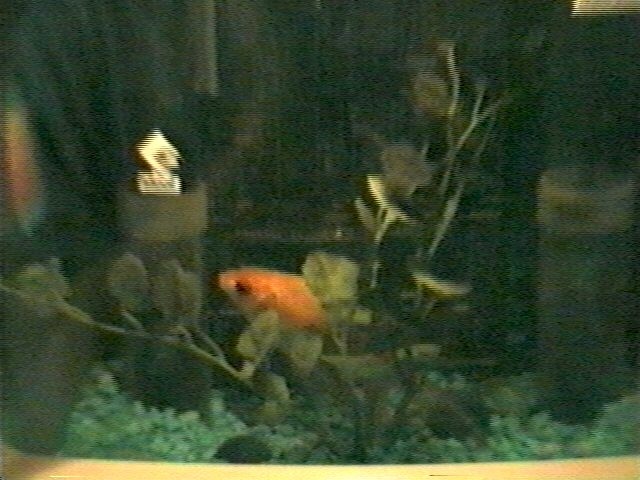 This was a 2D picture of Clarus, and it make very comprehensive the 2D nature of Clarus and why it was so difficult to see her when view from side. 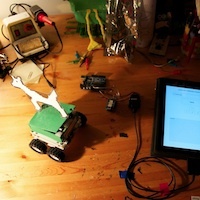 This robot then has been enhanced with an iPad Application to drive it. 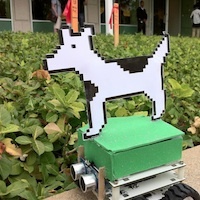 Finally, Erin bring the robot to WWDC 2011 and also at the Apple Campus (Infinite loop, Cupertino). 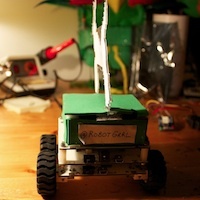 You can see more at the RobotGrrl entry in the Real World : Visit developper conference Collection. 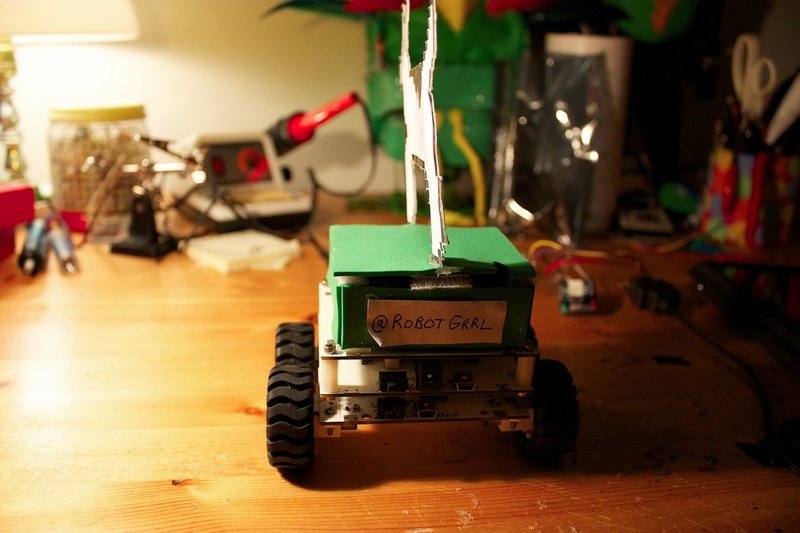 We also have a video from youtube demoing the robot controlled by an ipad. 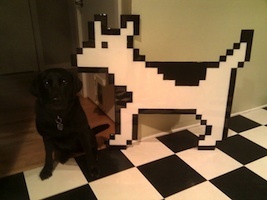 Tony build a life-size dogcow and document it with a picture gallery. Carlynorama made a 3D simple Clarus board ready to be printed with a 3D printer. 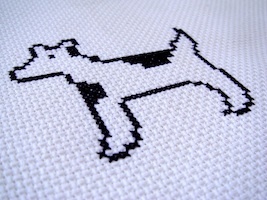 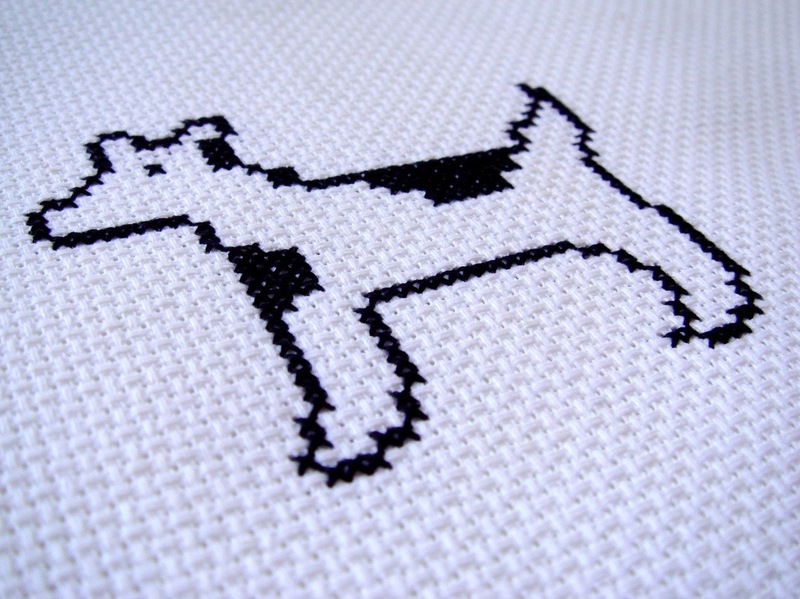 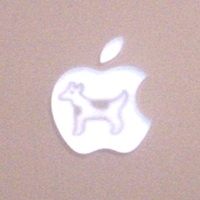 "Unique Keycon of the Dog Cow icon from the original Mac OS icon set. 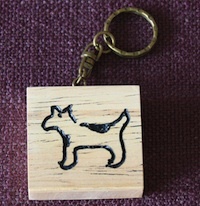 Handmade key chain etched in wood." 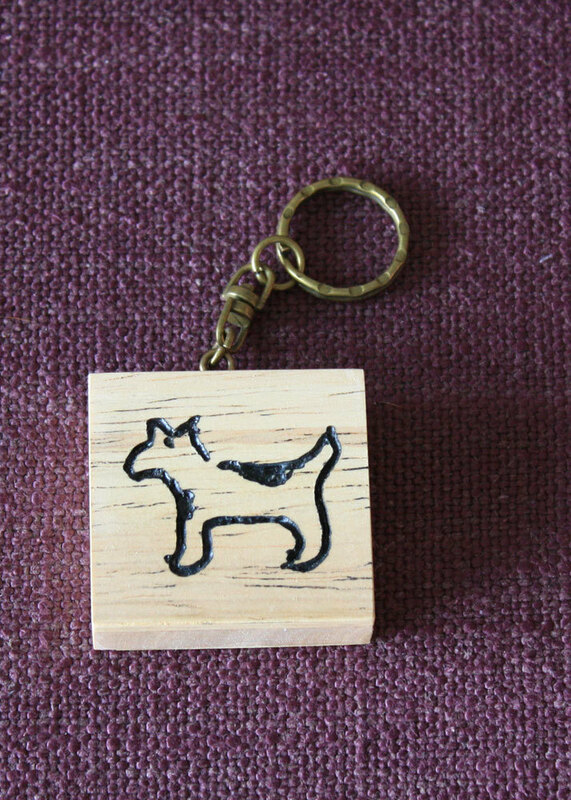 Pedro use the Etsy service to print on-demand personnalized keychain. Of Clarus was part of it. 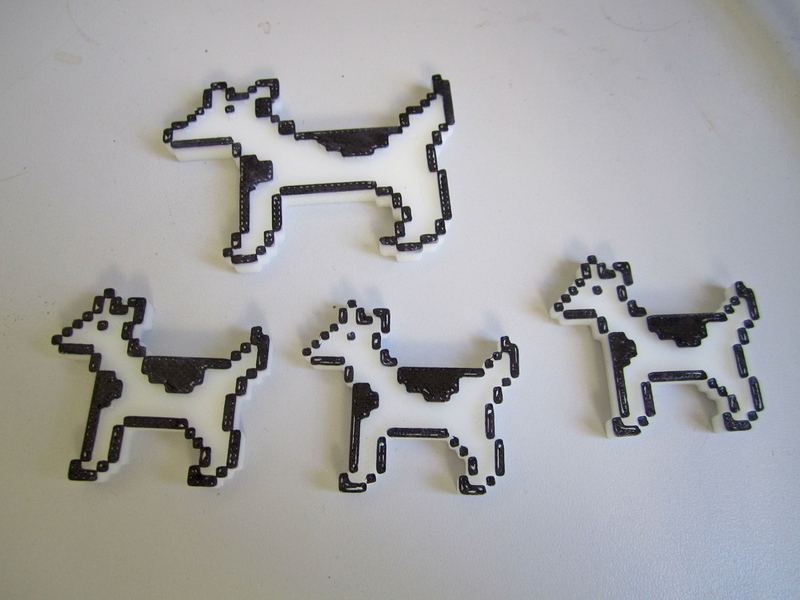 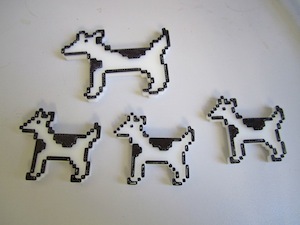 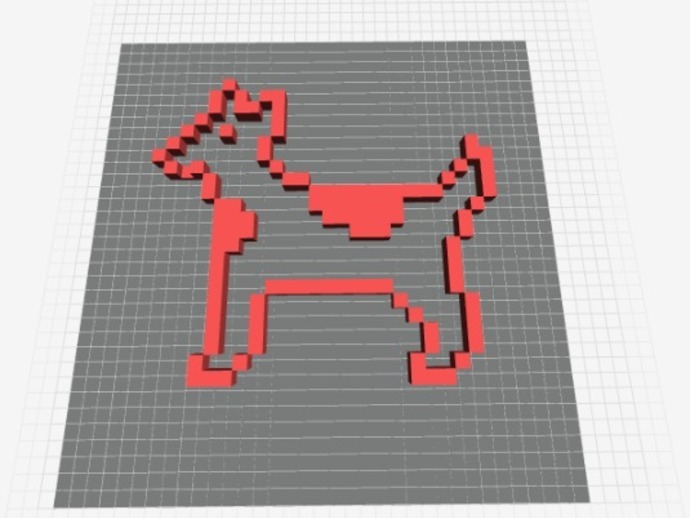 Pierre-Alain made 3D Dogcow using OpenScad, 5 dogcow models ready to be printed at home with any 3D printer.